This article is about the men's team. For the women's team, see India women's national field hockey team. 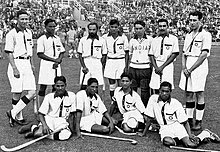 The India national field hockey team was the first non-European team to be a part of the International Hockey Federation. In 1928, the team won its first Olympic gold medal and until 1960, the Indian men's team remained unbeaten in the Olympics, winning six gold medals in a row. The team had a 30–0 winning streak during this time, from their first game until losing in the 1960 gold medal final. India also won the 1975 World Cup. India is the most successful team ever in the Olympics, having won eight gold, one silver and two bronze medals till date. After their gold medal win at the 1980 Olympics, the team's performance declined through the next three decades, with the team failing to win a medal at the Olympics or the World Cup. In 2016, the Indian men's team won its first ever silver medal in Champions Trophy and reached the knockout stage of the Olympics for the first time in 36 years. As of 2018, the team is ranked fifth in the world. From February 2018, the Government of Odisha has started sponsoring the Indian national field hockey team, both men and women team. In a first-of-its-kind association, the state has decided to support the India's field hockey team for next five years. * denotes players part of the 2018 Men's Hockey Champions Trophy squad. Caps as of 27 October 2018 as per FIH. ^ "Hockey India". Retrieved 7 January 2015. ^ "Odisha to sponsor Indian hockey teams for next five years". The Times of India. Retrieved 15 February 2018. ^ "Hockey India names 33-member squad for 2018 season". The Times of India. 3 January 2018. Retrieved 20 January 2018. ^ "Goalkeeper PR Sreejesh named in India hockey squad for New Zealand tour". Deccan Chronicle. 8 January 2018. Retrieved 20 January 2018. ^ "Ciriello roped in as analytical coach of Indian men's hockey team". The Times of India. 16 January 2018. Retrieved 20 January 2018. Wikimedia Commons has media related to India men's national field hockey team.